Green Office: Steelcase Think Chair--"the Chair with a Brain + a Conscience"
My first installment to the "Green Office" segment is about the office chair. I walked into a friend's downtown office (a lawyer) and he had some beat up, patchy furniture inside. I asked him what the deal was and he responded that it was all the firm provided. That gets me, big-time. For all you professionals out there, especially young professionals, your job is your domain and if the bossman isn't providing it, do it yourself. My credo, dress and office like the person who's job you want to have. So I prefer CEO-style all the way. If clients come in my office, they'll see CEO-style. Compare that to the cubicle next door and they'll form an impression about your position in the firm. You've got to be a rainmaker, so this is all about looking the part. As far as office chairs go, there seems to be a race to ergonomics--"Ooh, nice, is that so and so's chair?" "Did corporate get that for ya?" "How much does one of those run?" You get the drift. Steelcase, Inc. makes this entire process very easy, actually, modern + green easy. They have two chairs that are Cradle to Cradle™ Certified Silver: Think™ + Leap®. I'm going to focus on Think. Think also received the BusinessWeek 2006 Gold IDEA award, IIDEX Sustainable Design Gold award, NeoCon Editor's Choice Award, and the Red Dot Award for Product Design (Germany). But forget accolades, here's where sustainability meets the chair. First, cradle to cradle for this chair means the company considered what goes into the chair, how it is made, and what happens to the chair when it is no longer a chair. The chair is designed to be highly recyclable + safe for environmental health. Second, the chair is up to 99% recyclable by weight + up to 44% recycled content. Third, disassembly takes about 5 minutes and Steelcase has set up the structure for customers to participate in recycling of their used chair. 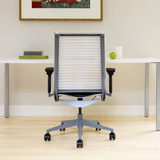 Fourth, the chair is Greenguard Indoor Air Quality Certified. But if this is too green for you, there's more. Think is comfortable too. It has the adjustable arms, pneumatic seat height, and innovative back "flexors" that track and respond fluidly to your natural weight and movements. So not only is this chair environmentally conscious, it's smart, too. I think an added benefit to the chair is that one can order the thing online and have it shipped FedEx ground-style for free. So, if you're tired of that standard office stuff and want to make a change, I'd get one of these Steelcase chairs shipped straight to the office. Nice looking chair. Although I'm not what I would classify as "completely green", I do like the fact that it's made of most;ly recyclable material. I'm trying to teach my kids about recycling so this type of chair would be an excellent opportunity to lead by example.